Look what the postal person brought to my mail box today! Betty (Mom) is second to turn in her HSTs for the swap that I've been coordinating. A great variety of darks and neutrals. All ironed nice and crisp. I even got two FQs as a token for my efforts. 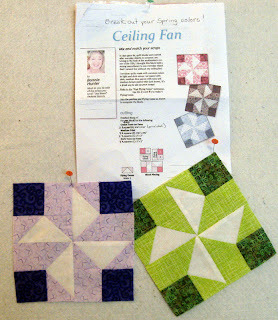 I'll be making in the not too distant future another design from the book by Pat Wys called Spotlight on Neutrals. The gray will be a perfect addition. While watching all the great dancing on Dancing With The Stars last night...I kept my sewing machine humming on the border sections. I was able to finish two As and two Bs as well as start on a third A. I'm liking what's going on so far. 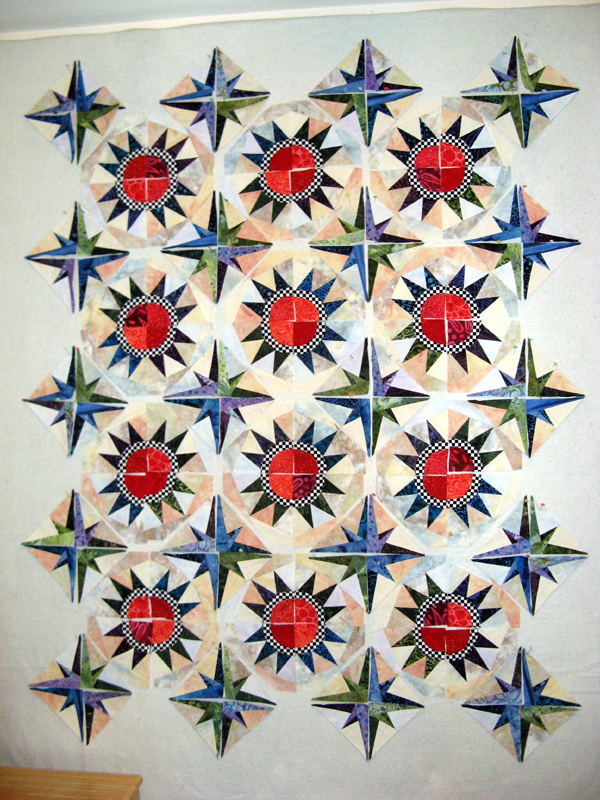 This Judy Niemeyer design Mariner's Star is one of her earlier patterns that was introduced in 2001. The fabrics are all from my stash so far. Looks like I'll have enough easily to finish the border. 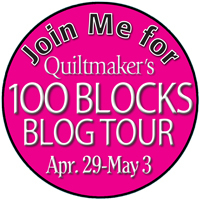 Take time today to blog hop through the Quiltmaker links as they roll out Volume 7 of their wonderful 100 Blocks series. I finished all the stars...on to the border units! This border has lots of pieces. There are two sections to each border component. I've got to make a total of 14 border components. 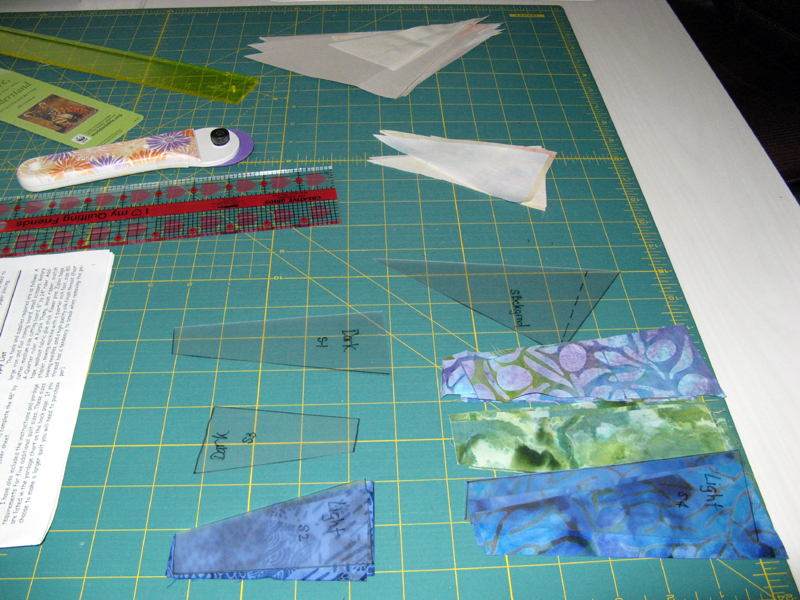 I'm just now starting to cut the fabrics with the first template. 29 done, 111 to go just on this one alone. Definitely going to be working on borders all week. 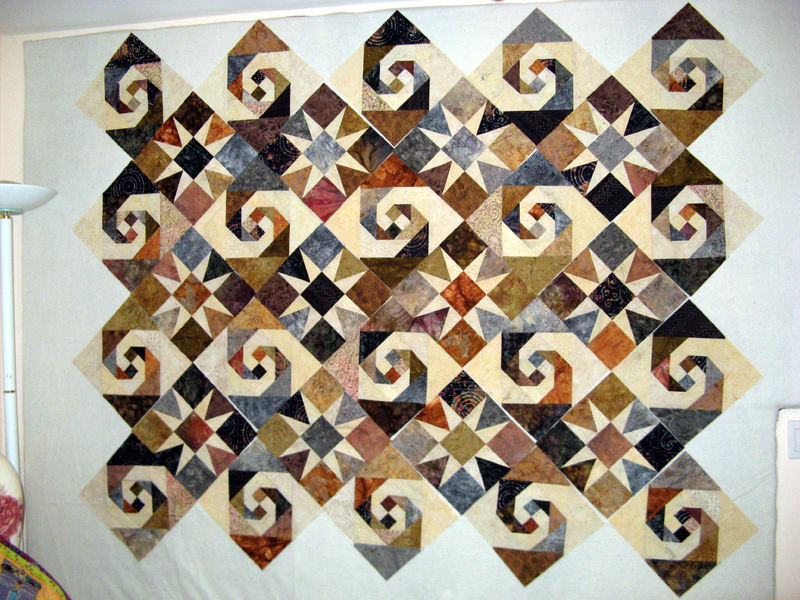 This is a pattern called Mariner's Star by Judy Niemeyer. All of it is foundation paper piecing and will finish 48" x 60". What fun project are you working on this week? There is lots more to see through the links at Patchwork Times. I've not had much time in the sewing room this weekend. I attend a Baby Shower on Saturday then later in towards the evening friends came over. Today I'm meeting up with life long friends who are visiting from Savannah for Brunch. Only progress on Kartwheels since Friday is assembling more stars. The stack of pieces on the top left have one more section to stitch on before trimming down to the finished size. This group will give me six more stars. I'll be working on stars for a few days into this week. Nothing to report new to my 2013 Stash Report this week. Kartwheels will change the report by 15 yards when I have it done, but that might not be for a couple of weeks yet. 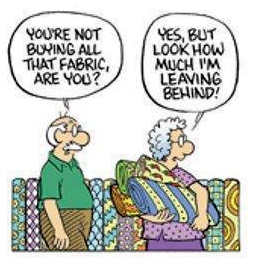 I hope you are enjoying the fabrics in your sewing room. Take time this today to notice what others are doing with their stash through the links at Patchwork Times. I continue to work on Kartwheels. Today I was happy to spend nearly my entire day sewing. I have nine of the 16 stars done. Until I have all of them sewn I won't put the parts together. 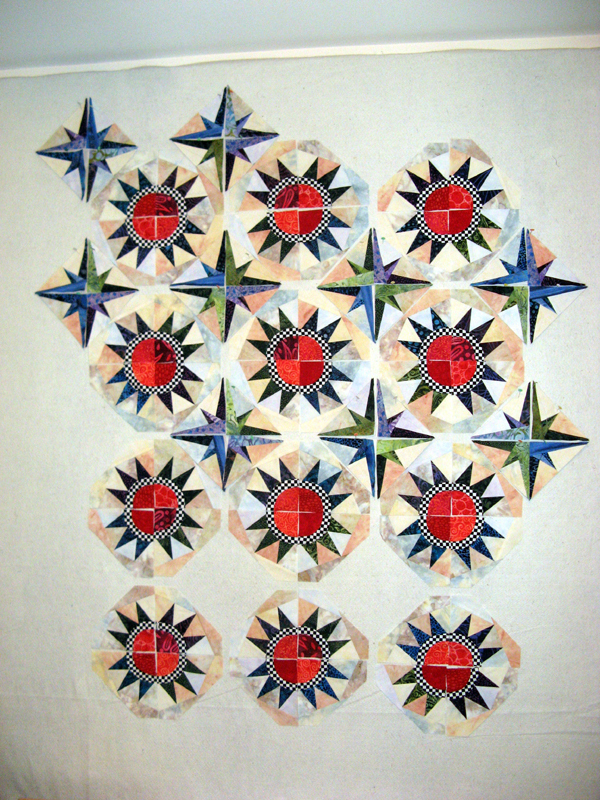 The stars get sewn to the corners of the arcs making them into a square. I have a little bit of playing around to do with colors. 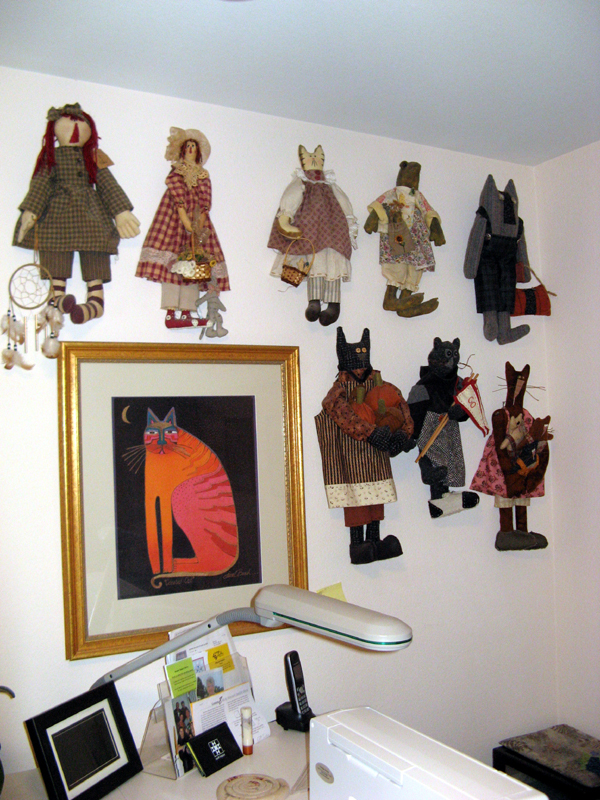 This next photo if a corner of my sewing room. On the top far right and all on the bottom row were all made by me at Country Loft. 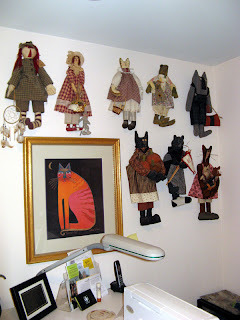 There are a couple more "cat" doll patterns that in time I hope to add to my collection. They sure are fun to do. I'm looking for another day of star making tomorrow. TGIF! Kartwheels at the start of Wednesday. I finished two more arcs with only two more to go. The melon sections are together for the last two arcs. Last part of the assembly will be prep'd at lunchtime tomorrow. This is just one of the arc blocks. Kartwheels will have blue, green, and purple arcs. I used four different fabrics for each of the colors. There are six different reds used in the melon center. I'll be mixing them all up in each arc block. 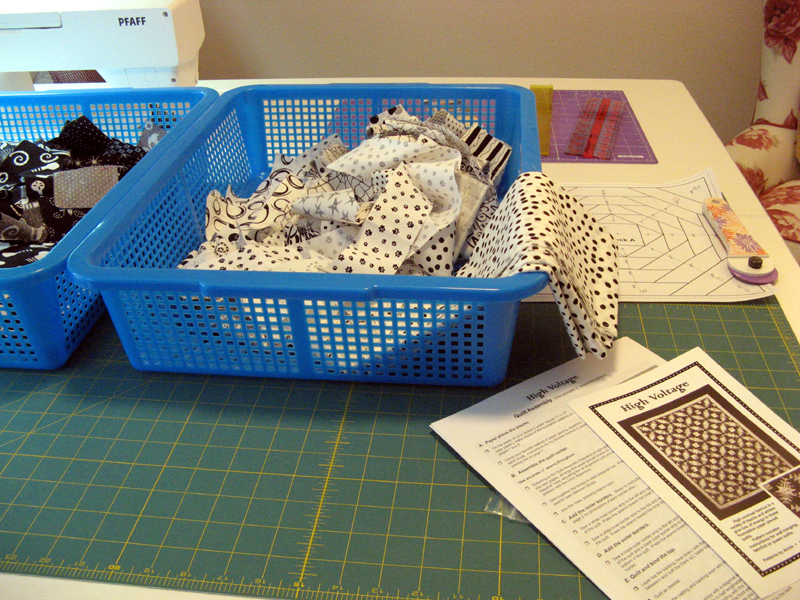 The only consistent fabric in this project will be the black and white check. The stars come next. 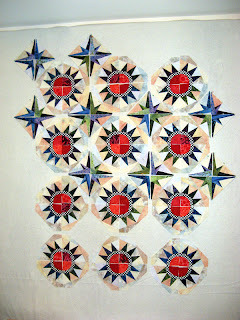 Check back tomorrow...there might just be stars on my design wall. I'm pretty excited with Kartwheels! I've got four more arcs to assemble. Two green, one blue and one purple. I'm taking my pins and scissors with me tomorrow so that I can pin the melon sections together. If the pins hold out I'll have the remaining 16 prep'd for sewing when I get home. 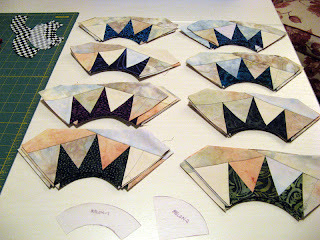 Then I'll prep the arcs for sewing once dinner is served and kitchen is cleaned. Tomorrow I don't have to be fixed in front of the TV for Dancing With The Stars Results Night until 9pm. My goal is to be into the piecing of the stars before nights end. I'll be using six different reds for the center melon piece. Mixing up each arc/melon section with four different combinations. Got to keep the scrappy interest going in my projects. If you noticed the pattern cover in the first photo there are stars to be foundation pieced as well and then that totally wild border also foundation pieced. 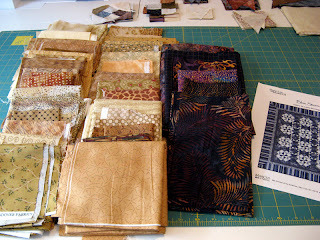 My background fabric is from Sew Batik; one of my most favorite resource for wide batik backs. Kartwheels is sure to keep me busy until May's UFO has been identified. 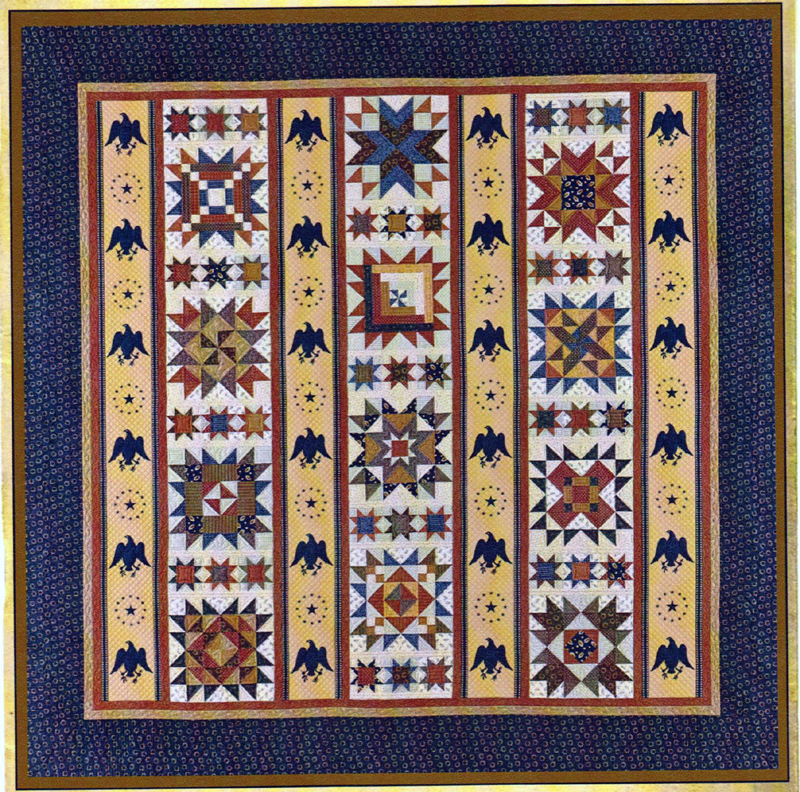 Be inspired more through the links at Patchwork Times. Come back soon to see progress on this and other projects from my sewing room. I have the binding done on Knoted (pronounced Noted, necessary to keep with the "K"s). 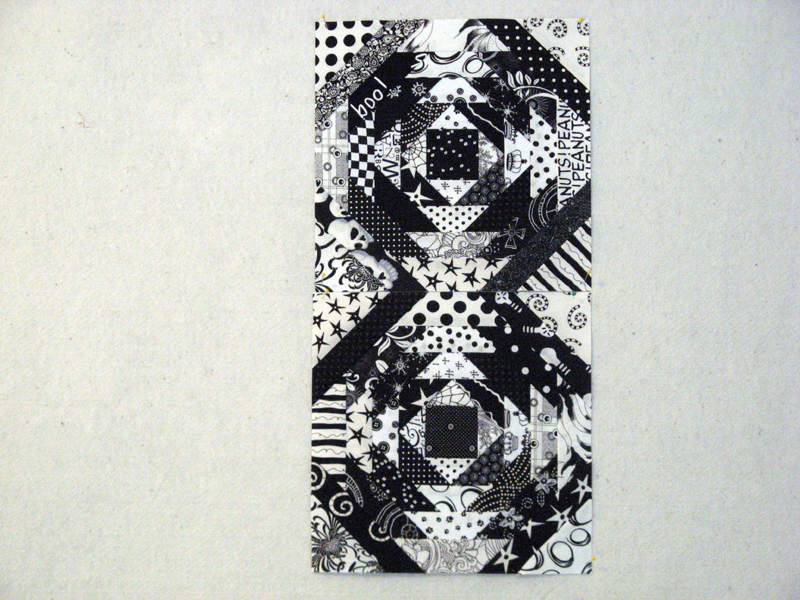 This is a pattern design by Judy Laquidara called Note to Self. She's made it available to us on her website for FREE! Thanks Judy. 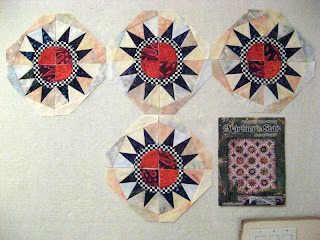 I stopped mine after three borders the binding is the color of what would have been the fourth border. 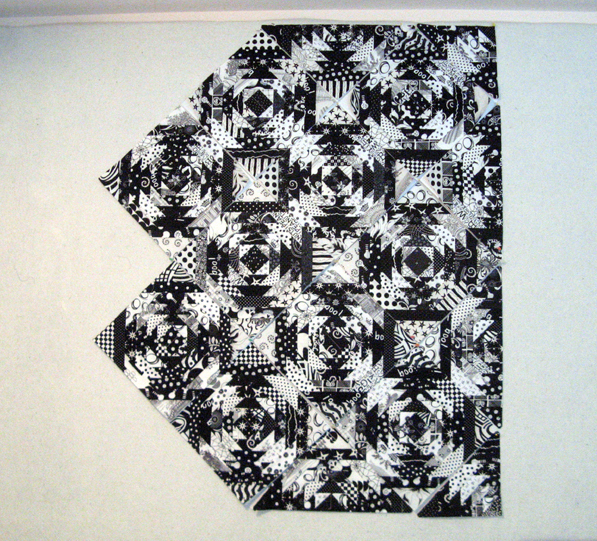 I used a favorite fabric in what appears to be black. It is actually a black with brown mottling. It is so rich. I've got some left so you may see it again in a future project. You can see my collection of finished quilts on my website. Kalahari is my April UFO and this week's Stash Used. 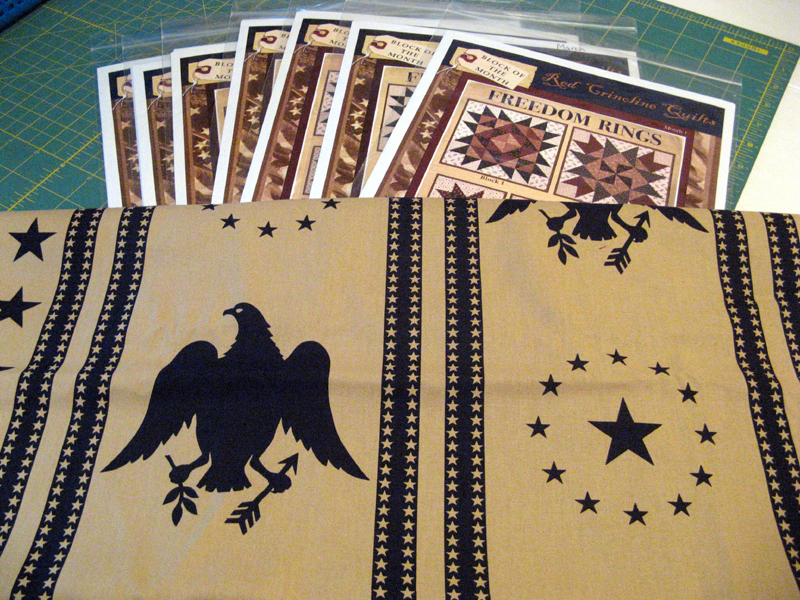 I've decided on the golds for the back instead of the easier purchase of 5.25 yards. The piece to the far right will be used for the binding. Today I'll start the cutting to 10" and probably get to the assembly of the scrappy back. That's it for this week. Hope you are enjoying your sewing projects and using your stash! 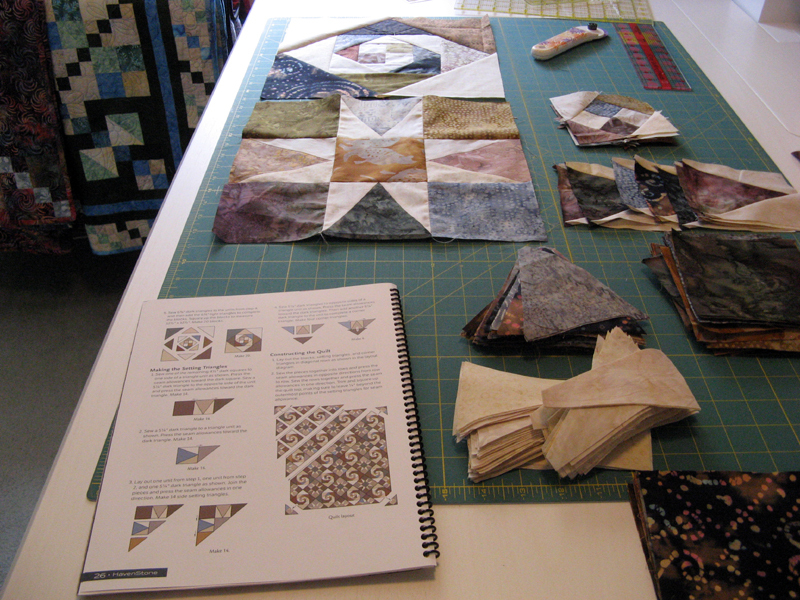 See other projects being used from stash at Patchwork Times. Kalahari is complete. 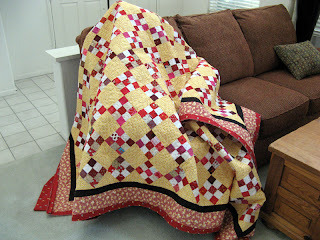 This project is my April UFO with 52Quilts.com. 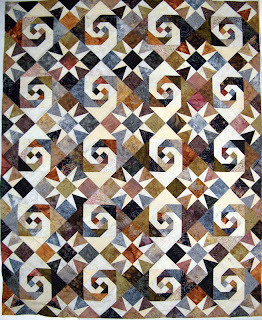 The pattern can be found in the book Spotlight on Neutrals by Pat Wys. I really love how it turned out. 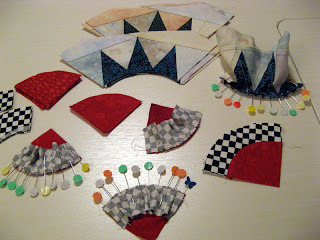 I used so many bits and pieces of scraps that I have too few pieces for a back. I've looked through my stash and besides using favorite neutrals nothing that works. I have a sizable piece for the binding...so now what? 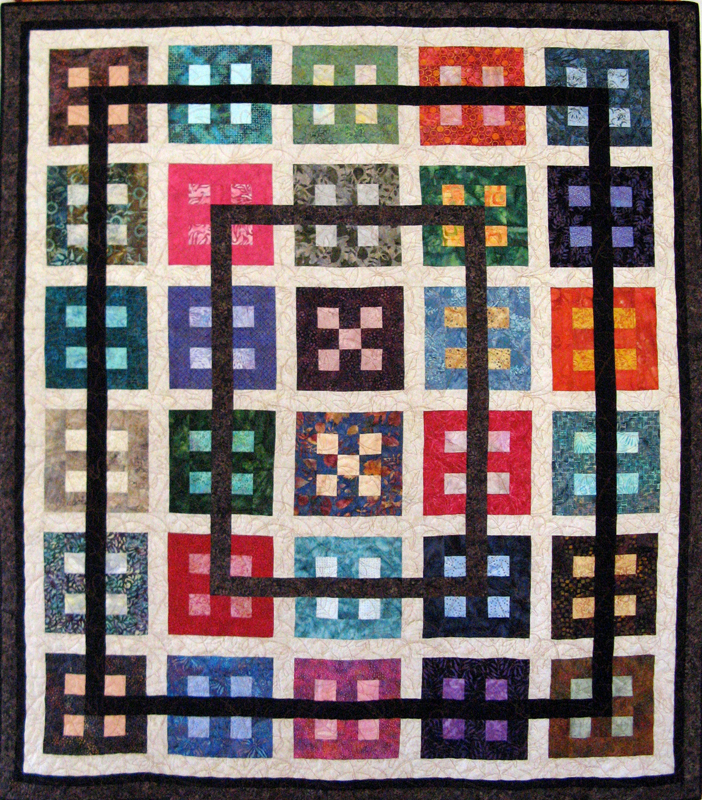 I'm tending to think of "anything" in the colors cut into 10" squares. I'll need about 80 squares if I go this route. My golds are busting the sides of the tote bin out...gold would work. I'll be thinking on this... I'm ahead of the deadline by a couple of weeks...what next will I turn my attention on? I mentioned being nearly finished with Kilowatts earlier this week. I did take the blocks in to pull paper during my lunch break. While Bonnie and I were busy...it caught the attention of a coworker. Needless to say she's asked to purchase it. She does want it to be twin size instead of it's current size. 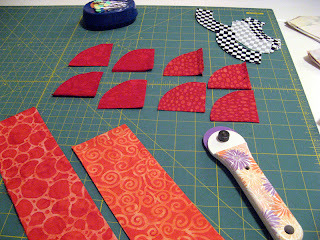 I will be making the same amount of blocks already made plus a couple along with more setting triangles. Caught just in time for making it bigger. I'll be spending the rest of my sewing day taking the dust off of another project. I'm thinking one of the 2011 UFOs that didn't get finished, Kartwheels. 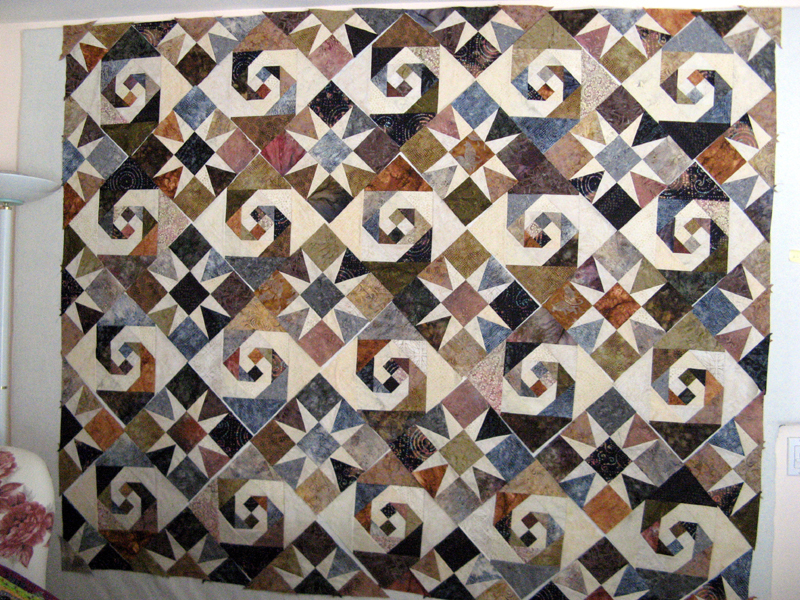 It's a Judy Niemeyer design called Mariner's Star. 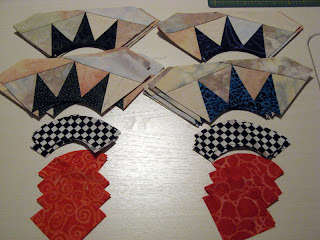 Yes, it is foundation paper piecing...what else would you expect from Judy? Knoted is all set for hand stitching. It has been a beautiful day, with tomorrow much the same. I might just have to crank up the umbrella and enjoy some fresh air. Today I start assembly of the parts. There is no border to this project. I am of the opinion it doesn't need one anyway. The instructions had the wrong layout for the corners. I knew something didn't seem correct when I first put them up on the design wall. After a bit of review the Clover seam ripper came out and 12 4.5" seams removed...12 4.5" seams resewn...I'm ready to put Kalahari together. I should be able to find something that will work for the back; even if piecing is in the cards. Should be a lovely day today. I may have enough time to sit outside and bind a little on Knoted. Enjoy your Thursday! Kalahari is on my wall still. I didn't sew much on this project over the weekend. 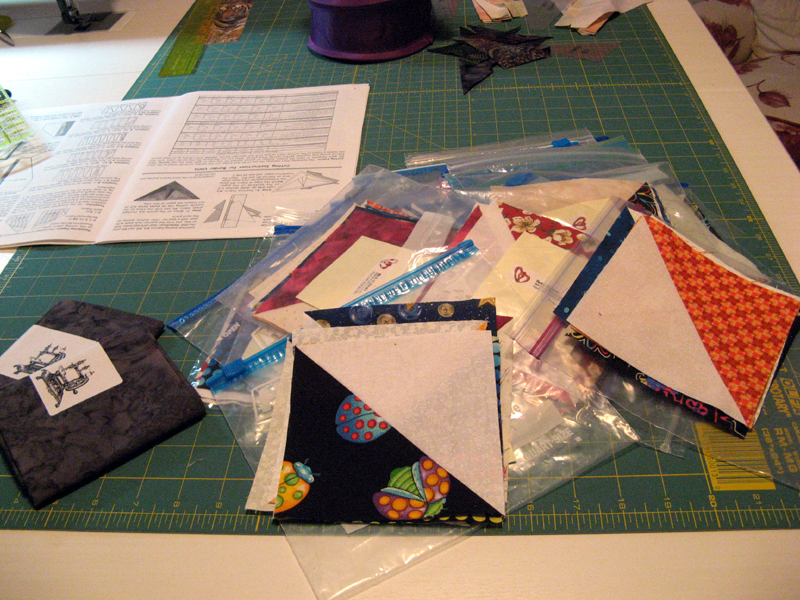 I did take sew one of the triangles and a corner just to see what it will look like. They go together fast which is nice. 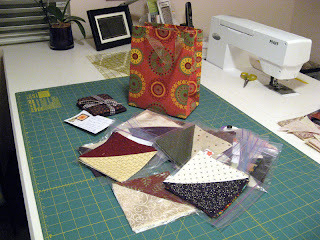 The monthly meeting of Canyon is tonight so no sewing until tomorrow. Kalahari will have my complete attention in the sewing room until the top is done. After all it is my April UFO and it's got to be done by the end of the month. 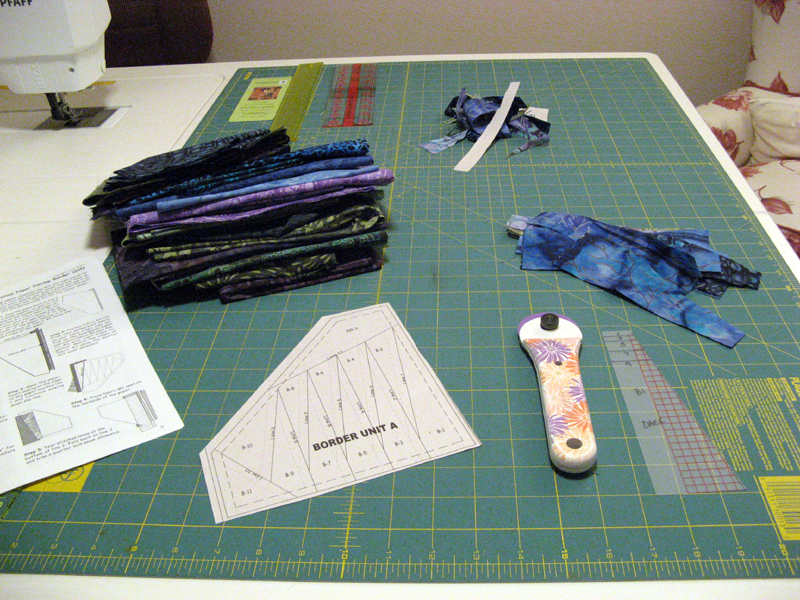 Saturday and Sunday sewing was on Kilowatts. I have all the blocks, setting triangles, and corners done. It's now time for removing the paper. I'll be doing that during my lunch break today. Maybe my friends will lend me a hand. Once Kalahari comes down from the design wall Kilowatts goes up. A second finish is looming this week. 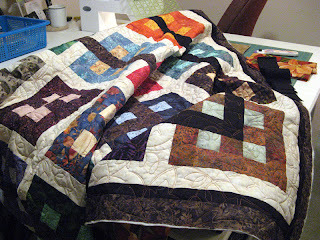 Saturday I got from Kerry my Knoted quilt. I have the sleeve and binding prepared and ready to sew down. Knoted is one of Judy's designs Note to Self that she gave us awhile back. Have you made this one? 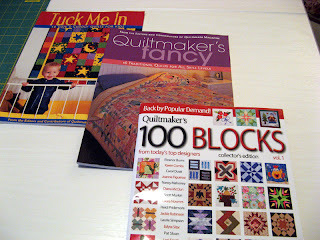 I check out Quiltmakers Blog nearly everyday. I happened to be lucky last month and won the three publications above. There are some nice projects within their pages. Notice its Volume 1 of the 100 Blocks magazine? This is one sought after Volume. EXCITED!!! This last project is Kloudburst. 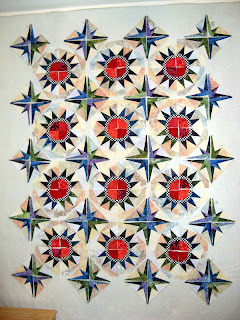 It's UFO number is 9 for Thirteen in 2013 with 52Quilts.com. Number 9 hasn't been called yet, but I'll be ready. 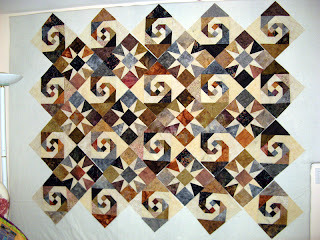 Hope you have time to glance at some of the other quilters who have participated this Monday on Patchwork Times. Have a great week ahead. 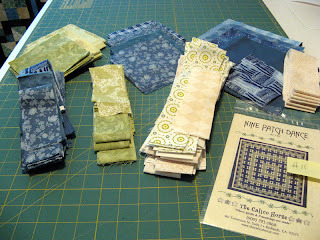 During the March Cruisin' Quilters Shop Hop this year I happened on this Country Loft project that was about to start. Kerry and I purchased the block patterns and the sashing fabrics which certainly complete the look. 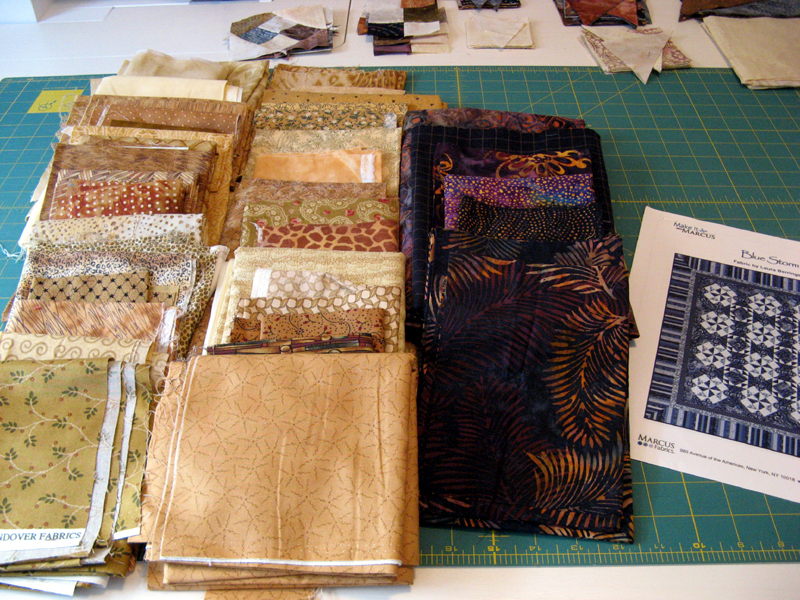 We won't be taking the workshop each month and plan to use our stash for the seven months of the BOM project. Perhaps this will be our "extra credit" for 2014... This will be a great way to use up scraps and complete a project that we'll both work on when we have our "sewing days" into the new year. Hey consider it's not so far off as you'd think. Sew I didn't finish Kilowatts before the report nor did Kalahari get to that point. Today will be a heads down sewing day where one or both might be finished. For now though I've only got purchases to account for...next week look out for a big reduction! So here is my status for the middle of April. 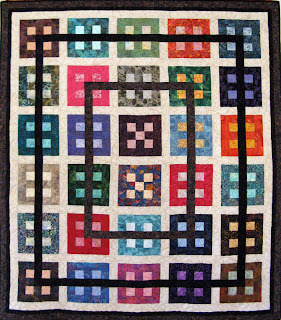 See others stash status through the links at Patchwork Times. I spent my Thursday and Friday working on Kalahari. I've got all the center blocks done. The pieces are all cut for the pieced corners and setting triangles. Both are designed similar to the star block. There will be lots of rearranging to get the colors right where the blocks intersect. I'll work on this project next on Sunday. 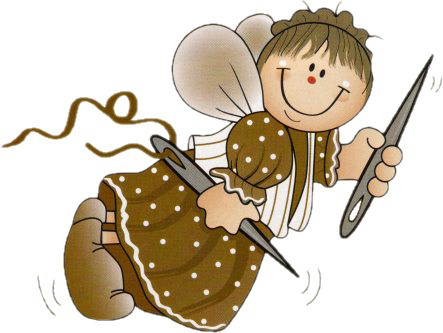 Today I'm heading over to Kerry's for a day of sewing. I'll be working on Kilowatts. 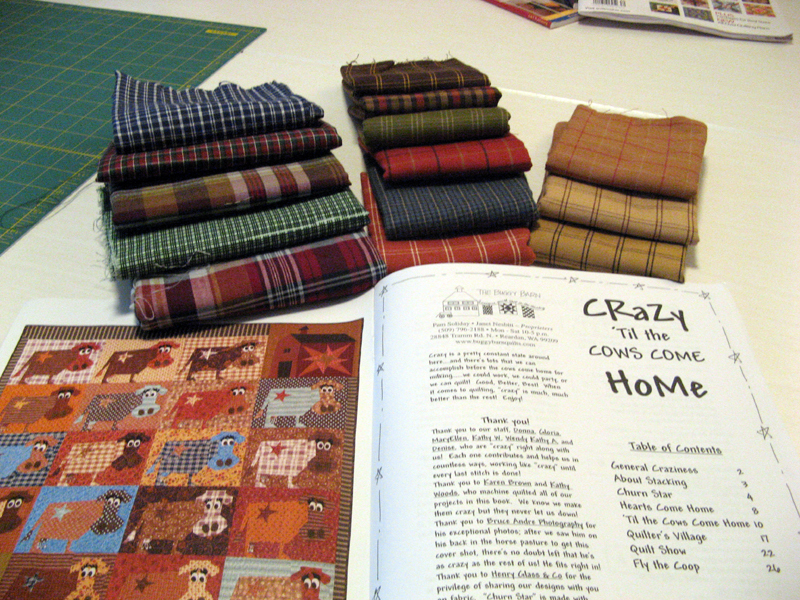 I've got some "new to me" scraps from Mom that arrived on Thursday. Thanks Mom! This should get me through the remaining blocks. Maybe there will be something to claim as used tomorrow on the weekly stash report! 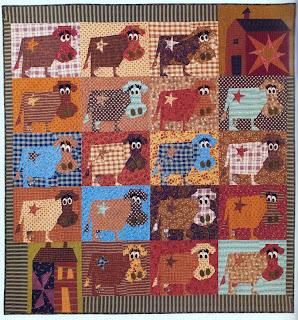 Isn't this newest Buggy Barn pattern so cute? I've signed up to attend a workshop on May 4th to get this project going. First I'll be working to collect some plaids. I don't have many of them. Mom sent me five with the white/blacks package. 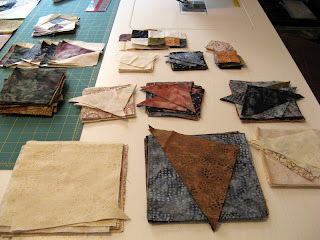 I hope to get to Country Loft to pick up something I have on HOLD...when I do I'll be looking for a few FQs. I like variety! Bonnie Sue is first to turn in her HST Block Swap. As is Bonnie Sue's way...the delivery is in a very cute bag; complete with a thoughtful token for me. Thank you Bonnie Sue. 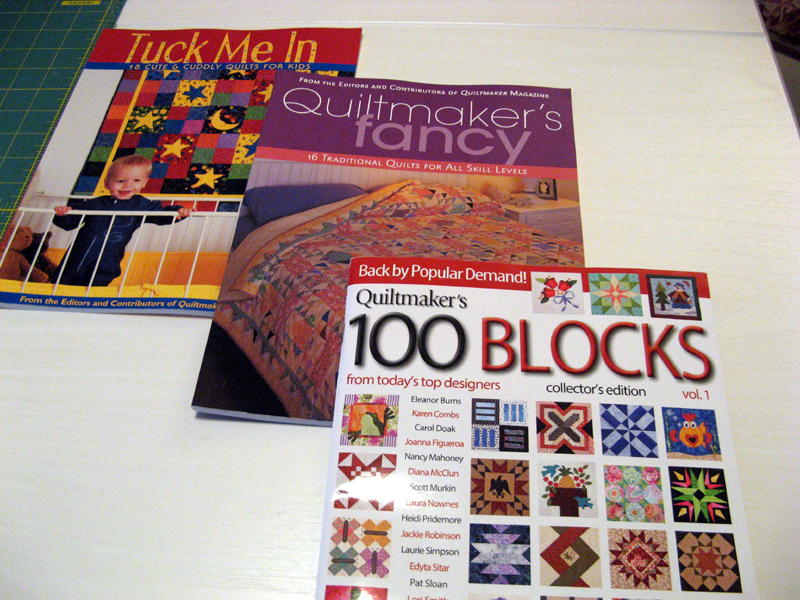 It is a pleasure that I can sew alongside so many wonderful quilters. 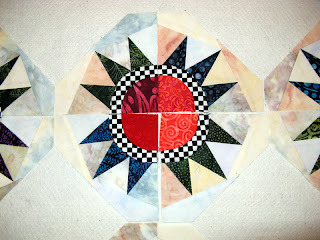 I attend Sunshine Quilt Guild's April Meeting tonight. Mary Huey presented the lecture. 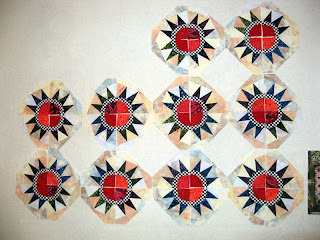 Mary has some great patterns and some fabulous ideas for making the quilts you dream of. Happy Monday! 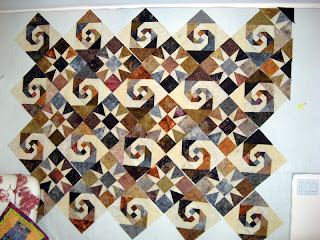 Today I have on my design wall the start of Kalahari which is my April UFO with www.52Quilts.com. Everything was cut sometime ago thanks to Netflix in the family room that happens to be close to the kitchen table. I wanted to see how the two block designs were going to look with the fabrics so I assembled one of each. I like what I see so far. I have lots more to assemble, but it should go pretty quick. 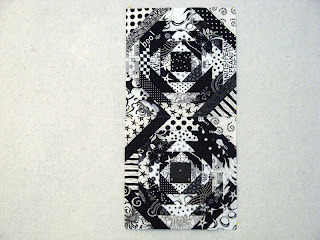 I really like the snail's trail block and this will be the second project this year using the same star block. This next one is ready for hand sewing the binding and the sleeve in place. 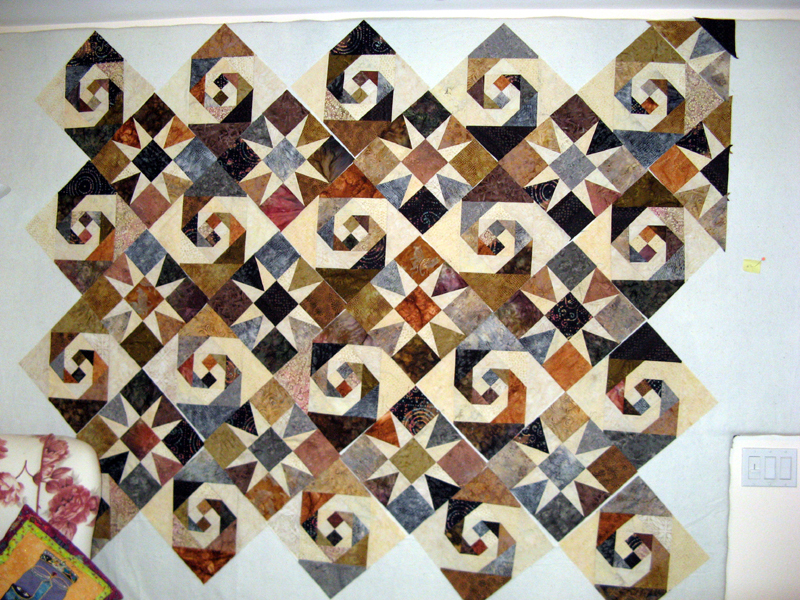 Karen's Knines is a big quilt measuring 95" square. 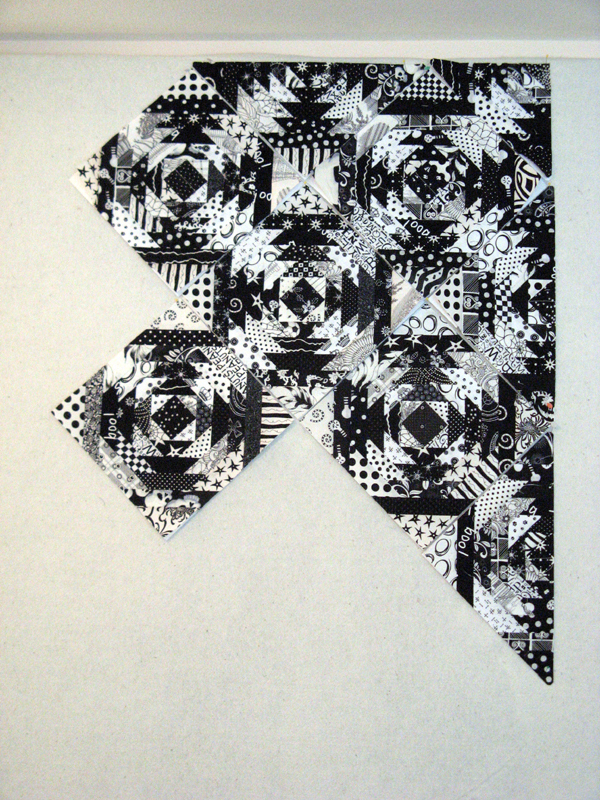 Karen's Knines is a Bonnie Hunter design called Sisters Nine Patch. 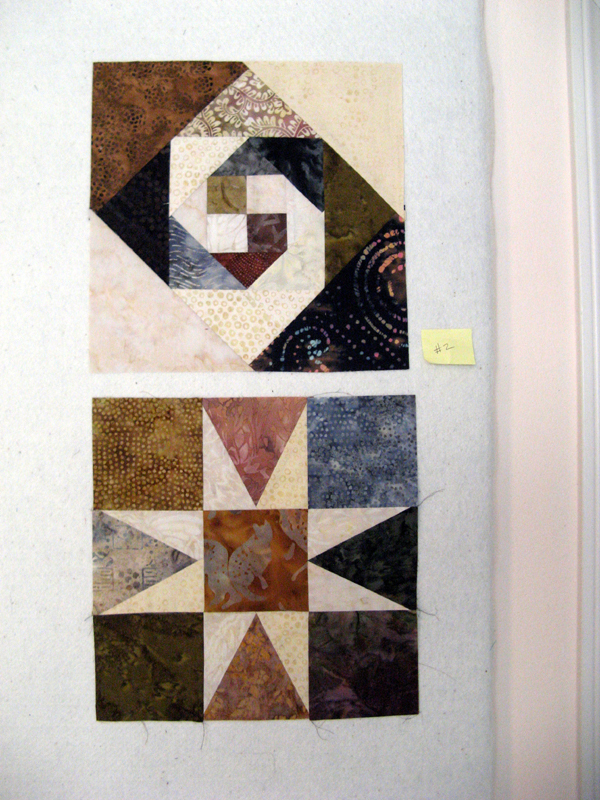 Kerry's Quilting as usual did an excellent job with the quilting. This is the next Netflix kitchen table project, Kloudburst. 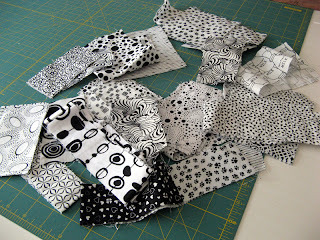 I'm doing my best to have as many UFOs in the "ready to sew" position. With this one there will be three ready. More on Kloudburst in the future. Other terrific projects can be seen through the links today at www.patchworktimes.com. Not a purchase this week for me. I will continue to work on Kilowatts through today then it's on to Kalahari. Kalahari is my April UFO. Kilowatts is using up all my black/white and white/black stash...plus some of my Mom's. 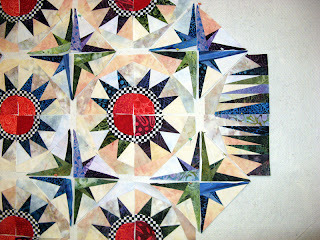 I have three more blocks, four setting triangles, and two corners yet to sew. Kilowatts will use 13.25 yards when said and done. I had time to cut the pieces for a UFO that has yet to be called to start. 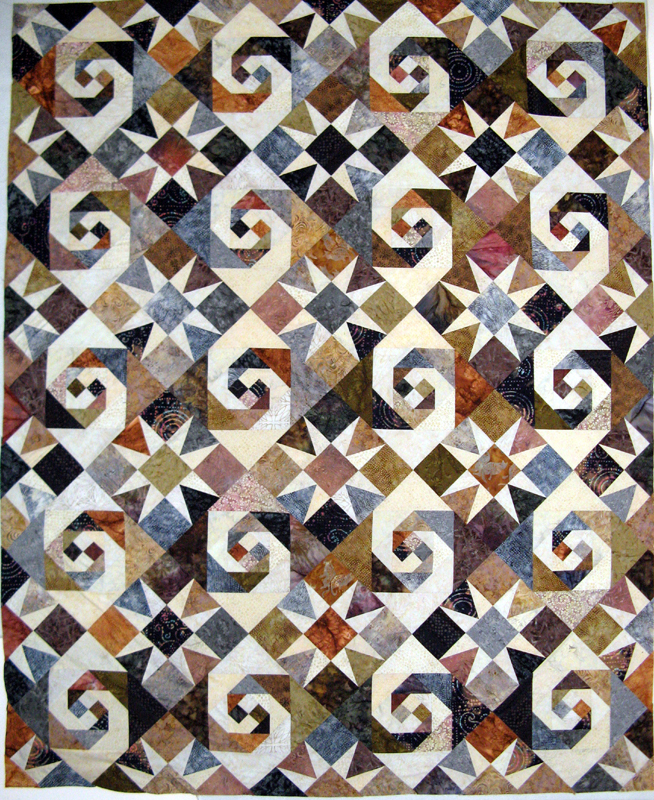 Korral is The Calico Horse design called Nine Patch Dance. 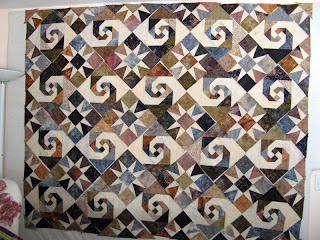 I picked up this pattern at Road to California Quilt Show a couple of years back. This one will use 12.25 yards, again nothing but stash. You will be seeing more of this project at some point in 2013. Kalahari is all cut out and ready for sewing. 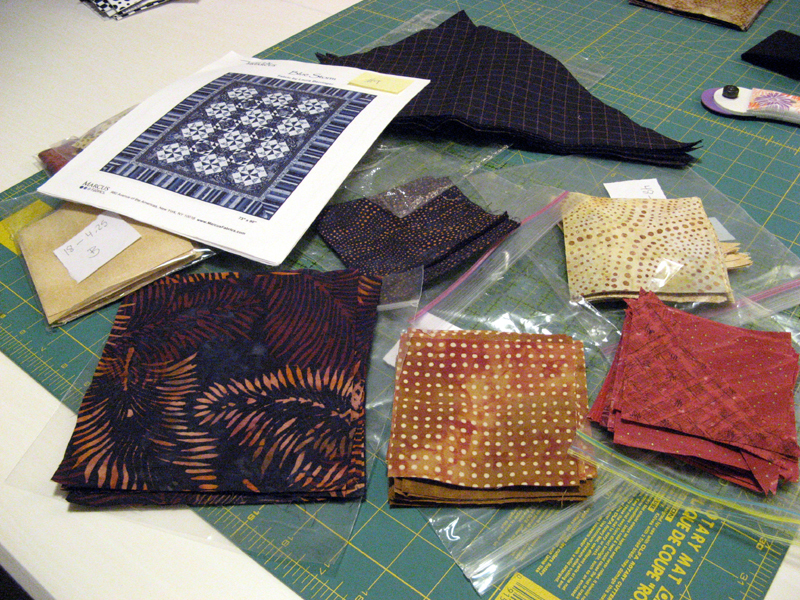 It will be nice working with batiks and color. Hope you are being able to use up your stash and in so doing creating a wonderful project. 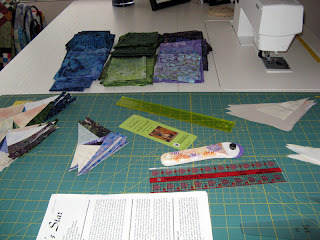 See how others are using their fabric stash through the links at Patchwork Times. Hope your day is going well so far. I've got plans to meet a friend for lunch. Barb does the best massage! We used to see each other once a week for a 15 minute seated back massage, but her routine changed at the beginning of the year which has meant no more weekly get together. We've been corresponding about a lunch date since and today is that day. We'll meet at Chili's for a taste from their wonderful kitchen. 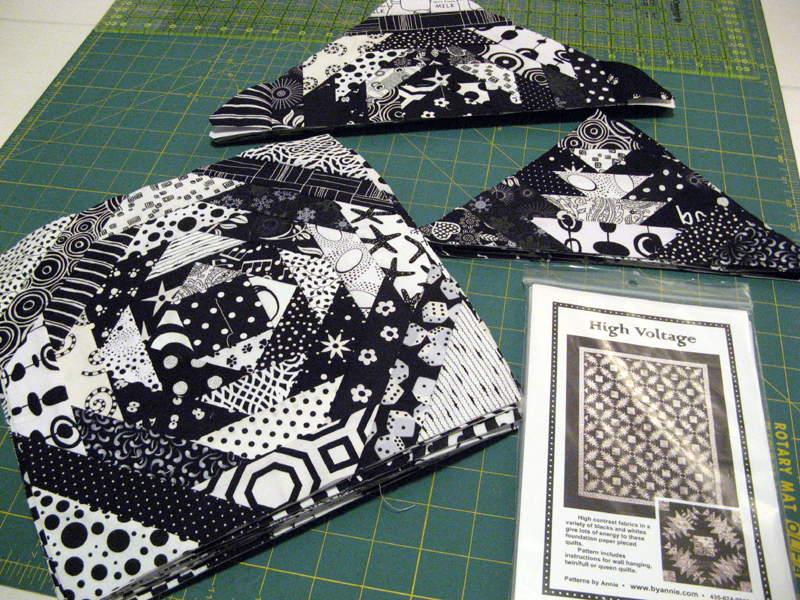 I have continued working on High Voltage with all my black/white and white/black scraps. 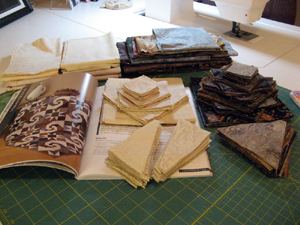 It is looking like what I thought was a HUGE amount of scraps will not be enough to complete this project. 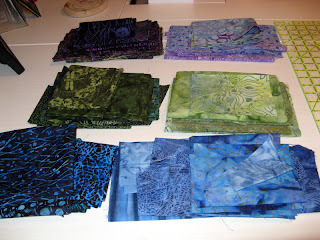 I still have enough to keep me sewing for awhile although I am pretty certain a plea to my Mom is in the future. 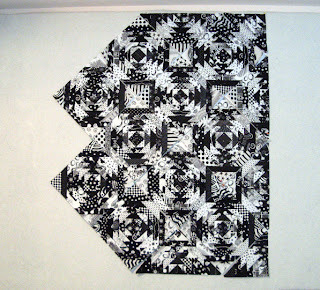 Mom has made lots of black/white projects and should easily be able to help me out. I won't be asking Kerry because she plans to make the same pattern in the same fabrics for the very same reason...use up scraps! At first the blocks looked to be too busy for my liking. Now that more are assembled the pineapple design is starting to show itself. I like it much better. It is slow going and easy to put the "black" where the "white" should go and vice versa. My Clover seam ripper has been seeing some action :)! I figure out a name for this project. Strangely get came to me after the postal person brought my electric bill. How fitting is Kilowatts? I'll be working on it until my fabrics run out or when Sunday comes along. I've got to dig into my April UFO Kalahari to make sure it gets done on time. 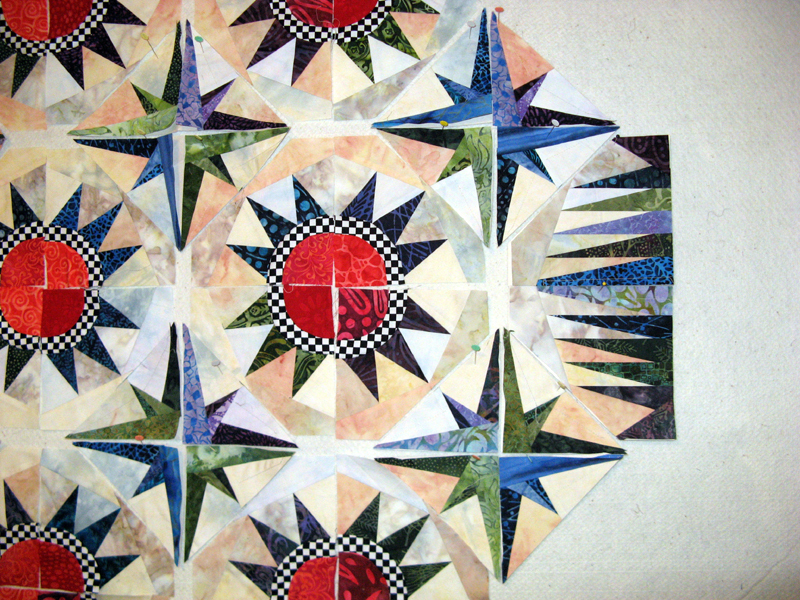 Sunshine Quilt Guild meets next Tuesday in El Cajon. 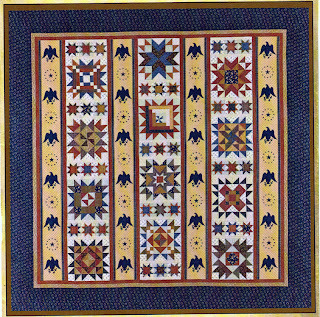 Joan brought us Bonnie Hunter's block design found in Quiltmaker for our BOM. The cream of the pinwheel was provided. The light and dark fabrics were directed to be Spring colors. These would be fun to put together with other like Spring colors. Maybe I'll be lucky and win this time...I'm due! Not much to show on my Design Wall this first day of April! Oh, Happy Fools Day!!! I finished Kommon Kongregation over the weekend, YEAH! Aunt Marti hadn't announced the April UFO...so my High Voltage got started. 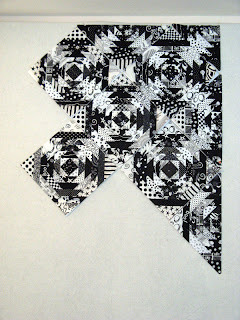 I purchased this pattern by Annie in January specifically to use up the growing stash of black/white and white/black scraps. I've done a couple of designs lately that used these fabrics and have ended up with nearly enough to complete the project. 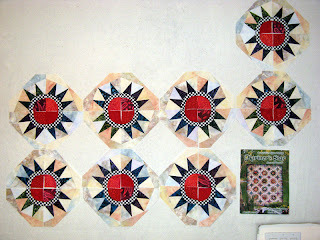 My Design Wall only has two blocks so far, but you can see there is lots more ready to assemble. 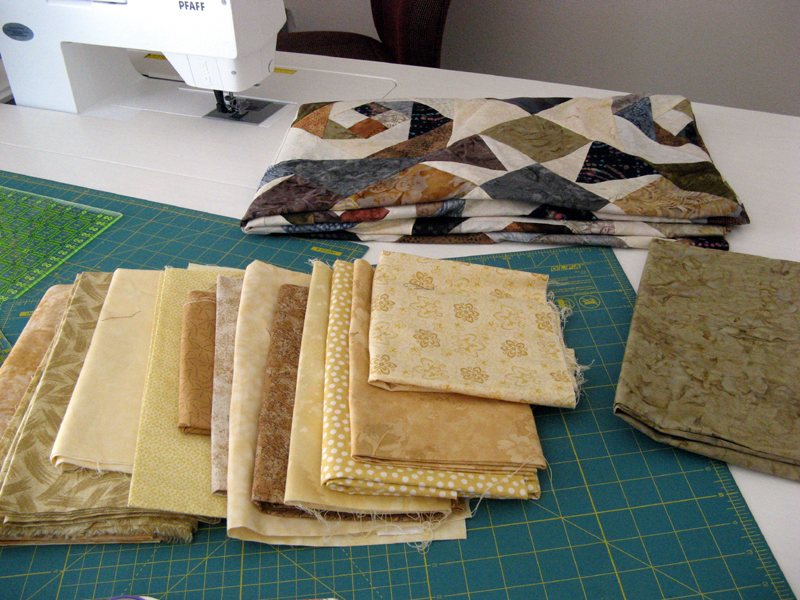 I had hoped not to repeat fabrics in the same block. This time my aim will be to use up and not purchase anything which means repeats. As long as I keep them far enough apart in the block I doubt they'll even be noticed. This should tie me over for a little while. So what's on your Design Wall today? See how others are working their stash through links at Patchwork Times. Enjoy your week ahead and come back soon to see my progress on this as yet named project.